There are many outstanding nonprofit organizations in Rock County. This 2017 Nonprofit Spotlight award winner has been doing the good work of providing at risk children with nutritious, easy to prepare food for the weekends and access to meal programs for the past nine years. The Luverne Back Pack Program serves 180 students. The success of this organization rides of the dedication of a working volunteer board. The program is funded through charitable gifts from individuals, businesses, organizations and grants. The program has very little overhead due to the generosity of rental space and being an all-volunteer labor force. Carrie Soto, President of the Back Pack Program, reports that 98 cents of every dollar goes directly for the purchase of food. Outside volunteer groups are also involved in helping the Backpack program be successful. Businesses, churches, coffee groups and more volunteer to pack food bags each week to be delivered to the school and anonymously placed in lockers of eligible students. The Backpack program has grown once serving only elementary age students to now offering its food program to ages three through 12th grade. Middle school and high school students have the opportunity to hand select food to help meet their hunger needs. The Luverne Backpack Program works hard to bring the issue of food insecurity to light in Luverne. Carrie states, “We have a beautiful community and it becomes easy to think that issues like food insecurity don’t exist. By speaking about the issue, the challenges, and needs of many of the families that we serve, we have been able to help bring about a greater understanding and sense of collaboration. 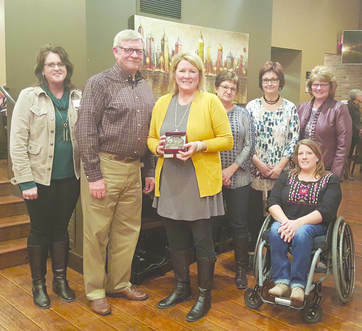 All of which helps further our mission of Enriching lives one bite at a time.” Congratulations to the Luverne Backpack Program and its volunteer board members. There are many outstanding nonprofit organizations in Rock County. The transformation of Atlas of Rock County makes it this year’s Nonprofit Spotlight Award recipient. Atlas of Rock County has demonstrated commitment to the community through hands on involvement, financial support and leadership to those in need in our community. Director Vicki Altena describes their work as, “Just doing life together.” They offer one-on-one mentoring and support individuals and elderly with whatever needs they might have: transportation, moving, cleaning, grocery shopping, and doctor appointments to name a few. They have over 100 volunteers and are supported solely on private donations. There are no charges for any service they provide. Their leadership in the community is based on seeing a need and meeting that need. The opening of Redeemed Remnants has assisted with affordable housewares and furniture. A moving trailer purchased with a grant from the LACF has allowed them to help those with no support system to move or transition into affordable, safe housing. They are the host of the annual one warm coat project giving away 200 coats to date. Currently they are transforming two apartments above their thrift store for emergency temporary housing. Atlas of Rock County is committed to collaborating with any organization in Rock County to help its residents get back on their feet and be contributing members of our community. Their goal is to unite people to extend a helping hand to anyone who needs encouragement and support. The power of giving has impact that lasts a lifetime. Thank you Atlas of Rock County.